I am always up to try new things, especially when it comes to food. One of the places I was most looking forward to trying as I traveled around North Carolina was the Tavern in Old Salem, which offers a traditional Moravian menu. When I finally got to that part of the state and made it to the tavern, I was not disappointed. The Moravians are an interesting group which trace their history back to Moravia and Bohemia in what is today the Czech Republic. Their beliefs stem from the teachings of John Hus, a professor of philosophy and a rector at the University of Prague, who protested certain aspects of the Catholic Church. He would be tried as a heretic and burned at the stake in 1415. His ideas did not die with him and in 1457 in the town of Kunvald, The Moravian Church or Unitas Fratrum (Unity of Brethren) was founded. Seeing as this was 60 years before Martin Luther nailed his 95 theses to the door of the Catholic church in Wittenburg, the Moravians are considered one of, if not the earliest Protestant group. The Moravians would come to the new world for the first time with James Oglethorpe as he established the colony of Georgia in the 1730s. Oglethorpe preached religious tolerance (as long as you weren't a Catholic!) and his anti-slavery beliefs were also highly regarded by early settlers. His great experiment would ultimately fail and the Moravians would go on to settle in the cradle of religious freedom: Pennsylvania. Along with the Amish, the Mennonites, the Lutherans and several other groups, they were broadly referred to as the Pennsylvania Dutch. There is still a large Moravian presence in Pennsylvania centered around the town of Bethlehem. In 1752, the Moravians purchased a 100,000 acre tract in North Carolina, known as the Wachovian Tract. Within this tract, the town of Salem was established in 1766. Salem merged with Winston in 1913 creating the city of Winston-Salem, the only hyphenated name recognized by the U.S. Post Office. Today. 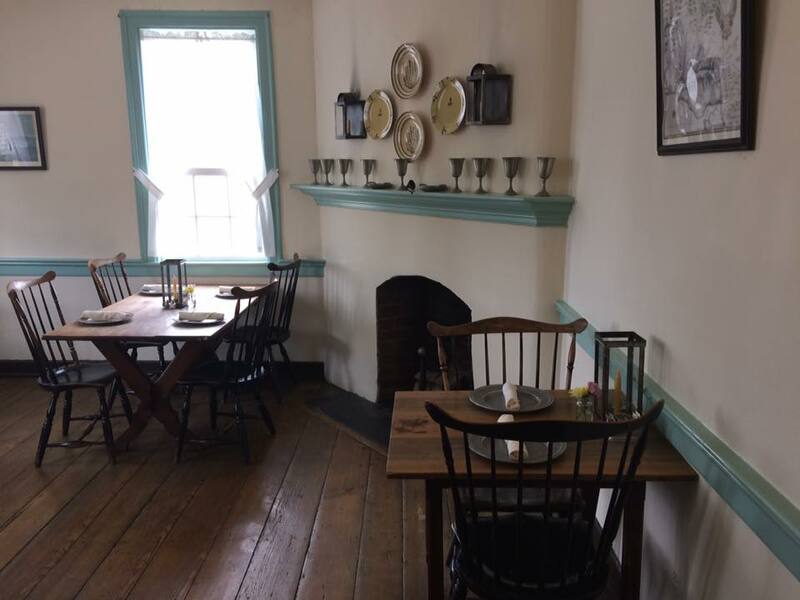 historic Salem is a living history museum similar in many ways to Williamsburg in Virginia. A group of historic interpreters welcome visitors to learn about the old ways of living in a colonial Moravian community. There are still many private homes and also a university in Old Salem today, and it is a wonderful place to visit, even if just for a wander. The Tavern in Old Salem is a warm and welcoming place. The staff wears colonial clothing and the menu offers a taste of traditional Moravian food. Not being able to decide between the fried chicken livers and the Moravian chicken pie, I ordered both. I also got several sides with my meals: German potato salad, beets, green beans and potatoes. Everything I had was wonderful. The chicken livers were delicious - cooked just right and with a wonderful drizzle on them. The chicken pie, not a pot pie but more a crust stuffed with chicken and gravy, was also really good, the crust light and flaky and the chicken hearty and mild. The sides were excellent and I particularly liked the potato salad, a tart vinegar based warm potato salad. I did end up taking half of my food home with me and it made for an excellent dinner. Because I was driving, I stuck with water, but they did have a great rotating beer selection as well. My experience at the Tavern in Old Salem was a winner. The food was familiar but also unique and filled me up. The colonial ambiance was fun and my server, Michelle, was excellent and attentive. Oh, and my entire lunch including two entrees and four sides came to just about 20 bucks. That's hard to beat. After my lunch, I headed down to the old Winkler Bakery, also in Old Salem. They had a wonderful selection of breads and tasty treats. I got some of their famous Moravian sugar cookies, which were undoubtedly loaded with real butter and sugar and were absolutely delicious. I also picked up a strudel which I enjoyed for the next few mornings for breakfast. Everything was really good. If you're in the Winston-Salem area, you should definitely stop in at Old Salem for a meal and some cookies. It was all well within the comfort level of those who are culinarily less adventurous, but also different enough to please someone looking for something new to try. Next time I'm in Winston-Salem, I will definitely be back.